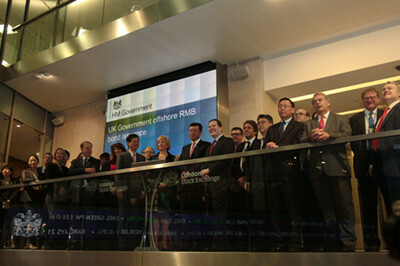 On 21 October 2014, Ambassador Liu Xiaoming attended the opening ceremony of London Stock Exchange to celebrate the launch and listing of UK government RMB bond at the invitation of the HM Treasury. The ceremony was also attended by Ms. Andrea Leadsom, Economic Secretary to the Treasury, Mr. Alexander Justham, Chief Executive Officer of London Stock Exchange, and representatives from the Bank of England, the City of London, the Bank of China and other financial institutions, business communities and Chinese and international medias. Ms. Leadsom said in her speech that the UK issues the RMB sovereign bond to implement the consensus reached at the annual summit and the sixth economic and financial dialogue between China and the UK and to fulfill its commitment on developing London as a centre for offshore RMB business. She said she was convinced that this important initiative will further cement Britain's position as the most important RMB market in the western world, and help to promote the internationalization of RMB. Ambassador Liu congratulated the UK Government on the successful issuance of the RMB sovereign bond. He said that the bond has made the UK Government the first non-Chinese issuer of RMB sovereign debt, which has great significance in the following three aspects: First, it renewed British Government's commitment to making London a centre for off-shore RMB business. Since the initiative was launched in 2011, Britain has created a number of records within a short span of three years. The issuance of sovereign debt in RMB has accentuated British Government's firm commitment to building London into one of the most dynamic off-shore RMB markets. Second, it created a new milestone of RMB internationalization. As the first major western country to issue RMB sovereign bond and by taking RMB as one of its reserve currencies, Britain will play an exemplary role in the world. Third, it provided a new driving force for China-UK economic cooperation. This issuance reflected the demand of fast growing economic ties between China and UK. The fast advance of London as an off-shore RMB market will create win-win results of deepening the trade and investment cooperation, as it will greatly boost China-UK business links and economic ties. After the ceremony, Ambassador Liu had on-site interviews with CCTV and Phoenix Television. On 14 October 2014, the UK Government successfully issued a 3-year maturity bond that raised RMB 3 billion, making the UK the first non-Chinese issuer of RMB bond. The proceeds of the bond will be used to fund Britain's foreign exchange reserves and RMB will become one of the reserve currencies of the UK. The bond received a high demand from investors, which are mainly the central banks, commercial banks and funds from various countries, with a subscription amount of approximately RMB 5.8 billion.